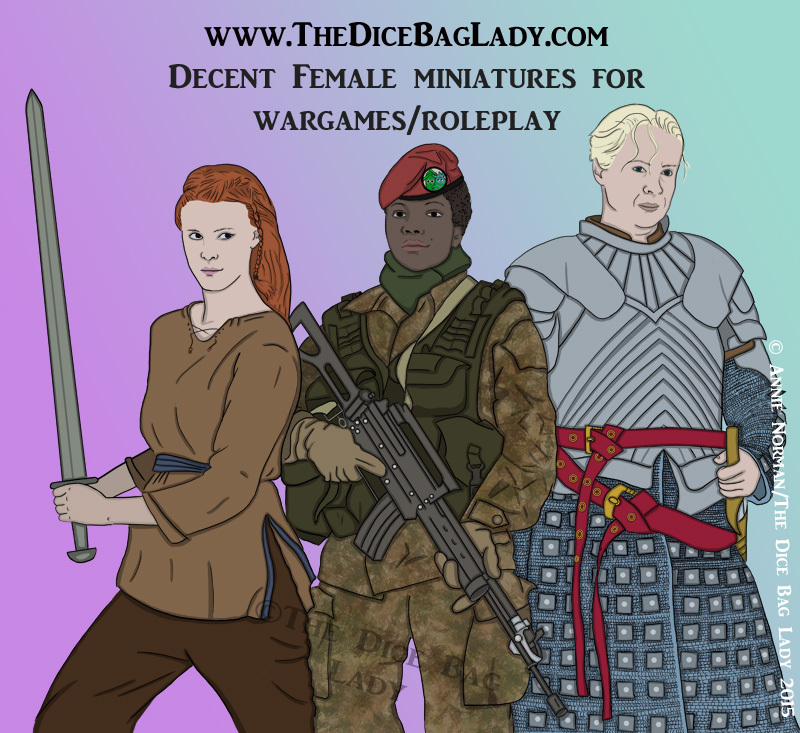 There are no shortage of female miniatures, not at all. What there is, is a shortage of models of women appropriately dressed for battle/war/exploring! ..but I am here to help! Recently launched is the "Proper Female Miniatures Emporium"
This began that came about by being hacked off at having to trawl the web for cool female miniatures that weren't overtly sexualised or ridiculous, and then having to spend more on postage than the models in some cases, buying one from here, one from there. So basically I've been trawling the web, so you don't have to, and handpicking some of the coolest mini women out there so you can get it from one place. I'll start taking all these to shows (starting with SALUTE), along with a growing display cabinet. It must already be the biggest place to exclusively get female models [from various manufacturers] and I want it to keep growing. This is already creating waves in the wargaming world and it would be great to see more manufacturers following suit. So far on board we have - Copplestone Castings, CP Models, Crooked Dice, Dark Sword, Dragon Bait Miniatures, Heresy Miniatures, Mierce Miniatures, Otherworld Miniatures, Pulp Figures and Wargames Factory. Coming soon are Hasslefree, Statuesque, Westwind, Bombshell, Forlorn Hope and Fenris. If you're a manufacturer and "want in" pop me an email via the contact form on the site! This entry was posted on Saturday, April 11th, 2015 at 22:00 and is filed under News. You can follow any responses to this entry through the RSS 2.0 feed. You can leave a response, or trackback from your own site. She wont have Gary, she sells the figures direct, it is not a list of where to get them from. I think it is a good idea, until browsing TBL site I had no idea that there were that many to choose from. It makes it easier for Joe Public to get all his or her female figures with only one lot of postage.